Klampis ireng is a famous haunted place and very sacred people in Ponorogo. Located in Gandu Kepuh Village, Sukorejo District, Ponorogo Regency. This place is in the forest in the middle of rice fields. At the entrance, there is a black semar statue and inside there is a circular monument and a hollow tube in the middle. It is said that there used to be a very rare Ireng klampis tree. According to Wikipedia Klampis or Acacia tomentosa is a kind of legumes tree commonly encountered in the tropics, and the word "Ireng" comes from the Javanese language which means Black. So klampis ireng means Klampis tree in black color. If generally, Klampis tree is brown, this tree is black. This may be another well-known reason for this place, where the extinction of klampis ireng trees. Historically, Klampis Ireng used to be the site of a clerk belonging to Kyai Semar, one of the famous puppet characters in the group of Javanese punakawan or warriors who consist of Semar, Gareng, Petruk, Bagong. There he taught the science of kejawen manunggaling kawula gusti which means united with God. Kyai Semar is known as a figure who is wise and has a god-level supernatural power. Because this place was once occupied by a powerful Kyai Semar, so many people held a magical ritual in this place. Usually, they come to look for wangsit, pesugihan, ask for clues, reject the reinforcements and others. The requirements that must be fulfilled in the ritual, among others, must provide 9 types of materials, such as, incense, cigarettes, hio, flower telon, fruits, and others. While the prohibition, among others, should not use green clothes and should not come on the night friday wage. This place there is also a Locksmith who guides visitors who visit this place. 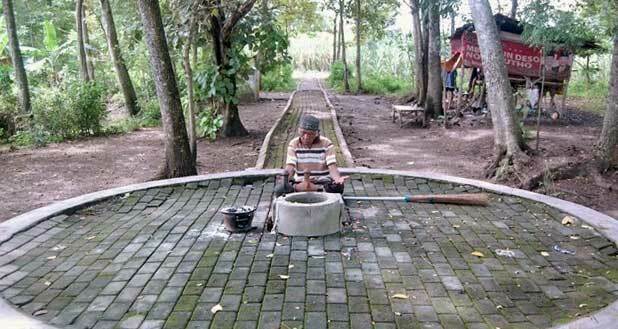 His name Mbah Giyanto, All rituals to be held visitors must be permission caretaker, if there is no permission and behave arbitrarily in this place then bad luck will befall it. This place itself according to Mbah Giyanto is a magical kingdom if we can see it will be plastered a real sight of the kingdom contains gold. There will also be Kyai Semar and other members of the clan who sit on the royal throne. This place is like a kingdom, anyone who speaks dirty behaves impolite will be bad luck. Including if we stole the wood in this area without the permission of the caretaker then at night the wood will turn into pieces of human feet. According to the story of the people once had one of the television stations that will make a test of guts in this place but unexpectedly his camera exploded and destroyed so the event had to be diverted elsewhere. It was an absurd incident. Ireng klampis wood is difficult to find, but there is someone who can find the wood in a magical though small. This wood is believed to have positive benefits, if displayed at home reputedly can bring peace, peace, and security throughout the contents of the house. Other benefits when used as an accessory, can bring fortune, wisdom, high wisdom, success, soul mate. Or for those who want to have a miracle like the science of immune, anti-witchcraft / witchcraft can try to wear it but with certain conditions. Whatever it is, all back to ourselves each may believe it or not. Obviously, keep asking for the only source of God Almighty because without His power and will all will not happen. Do not let us fall into the black world that brings disaster on ourselves in the world and the hereafter.